Te-ire (手入れ) is a Japanese Go term referring to a play which reinforces, repairs, or fixes up one's shape. Te-ire is an everyday Japanese word meaning "take care of" or "mend", and is used in this sense in Go as well. 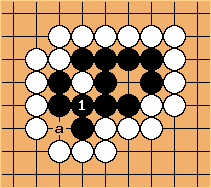 Te-ire also, however, has a more specific meaning in Go, which is a reinforcing play made towards the end of the game inside one's own area to prevent losses which could arise when all outside empty points are filled. 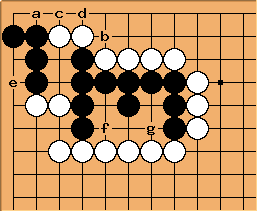 In the example at left, a is a required te-ire for Black, since once the dame point of b is filled, White could play there and capture the two Black stones. To determine the life and death of stones and territory, dame must be filled and te-ire played before the end of the game, in accordance with Section 8." 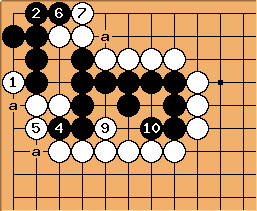 In the diagram at left, for example, Black must play te-ire at a. Black will eventually have to play at , since to play at a first would be self-atari. Even if White never plays at a, is required. We might have two, even three different senses of teire. It can mean making a move inside one's territory without connoting protection. E. g., "At the end of the game dead stones may be removed without playing teire", or "Black played teire to eliminate a ko threat". See http://members.jcom.home.ne.jp/igonote/kou.html . Bob Myers: I don't think this is a good example of te-ire in any of its senses and should be removed. John F. I advise extreme caution in using any of the Japanese sites mentioned here as an authority, unless you wish to catalogue amateur usage. The faulty analysis in Diag 14-3 on the Eba site is surely warning enough not to trust the text. In general Japanese amateurs have exactly the same problems as we have in pinning down definitions and picking up half-understood usages from pros. The pro literature I've seen supports the very first definition given by Bob at the top. It has to be a move inside (as a repair move). That is made explicit. The only quibble I have with the topmost definition here is that ireru does not literally mean insert (ie put between). It just means put inside, and that is the very point of the technical term. 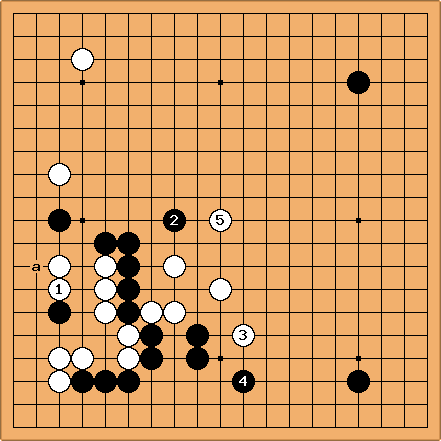 Te wo ireru of course is probably best rendered as simpy to add a move. A tricky point is whether a move added out of caution but unnecessarily is teire. I'd say not. (A little web searching later.) However, here is a pro example of teire used before the end of play. zinger: True, teire is not necessary for black. But white will eventually have to play teire at b. To Zinger: John F. No, and that is why some comments on this page are flawed. If White plays at the point to the right of a, he will eventually have to play a repair move (teire) at b. But if Black hanes, while White would also eventually have to play at b (or one point above), that would NOT be teire. Implicit in teire is the idea of having to _go back_ and patch up a defect _inside_ a territory. The more I think about it, the more I think it is misleading to try to tease out two or more meanings. Accept it is simply a yose (not endgame) issue, and you remove the need to differentiate examples late and early in the game. Accept that the rules cases are just very specialised examples of the basic meaning, and you end up with a single and very clear definition along the lines Bob first gave at the very top. However, there is an extra element that was mentioned but needs to be brought actually within the definition and that is the point that an _extra move_ has to be added (so that teiri is almost always talked about in the sense of a 1-point "loss", or in the cases of rules an argument over whether this "loss" is required). This is well covered by "adding a move" but I think that needs to be bound into a nexus of "go back/patch up/extra move" to convey the correct meaning. The reason for splitting go back and patch up is to cover the case where a player goes back and makes a move out of caution - as it is unnecessary that is not patching up. zinger: I see your point John. I was rather picturing the eventual sequence black c white d black a. 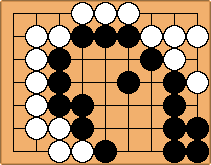 Then, after the dame in the bamboo joint are filled, white will play b. Would this be teire? - John F Yes, precisely. John F. Bill, I wouldn't disagree too much with what you just said, but that wasn't one of the points I was addressing. Just to get that out of the way first, agreed teire can be used outside the endgame (though always as part of yose!) but it is highly misleading just to say it means a protective move. I know you know, but other readers may assume that applies to things like covering cutting points. A more rigorous definition is needed. My real beef was with calling White 2 teire. The Eba site does but I don't believe they are right (except, given the context, insofar as he was thinking ahead.to the end of the game). Bill: John, it's fine with me not to use Eba's example. But I do think we need to have an example of teire before the end of play. And we need a clearer explanation, with maybe two or three different senses illustrated. Bill: The normal yose locally looks like this, with the three sente, - , - , - , and - . Then, unless they disappear because of ko threats (or otherwise), White will have teire at the a points. Bill: In 21st Century Go, vol. 8, p. 211, Go Seigen comments that White should play teire at or a. Territory scoring, no captives, no komi. Where must Black play te-ire?